Whopper's Bunker: "No evidence of aquatic humanoids has ever been found!" "No evidence of aquatic humanoids has ever been found!" The National Ocean Service, a subdivision of the US National Oceanic and Atmospheric Administration [NOAA] was forced to issue an official public statement denying the existence of Mermaids on it's website last week. 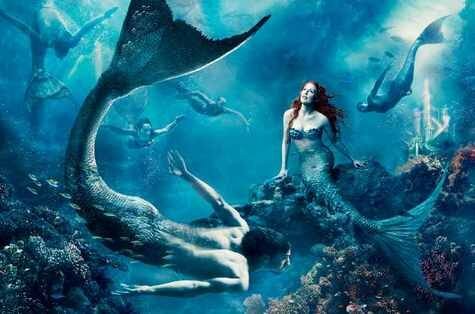 Apparently, Discovery Channel presented a special on Mermaids as part of their Animal Planet: Monster Week and the results were somewhat convincing to the US public to raise inquiries concerning the creatures. The BBC reported that the NOA received written requests for information and that Discovery has acknowledged that "the programme was a work of fiction but its wink-and-nod format apparently led some viewers to believe it was a science education show." In secret, UN officials have cited the incident as a "major blunder" by the paranormal watchdog agency UNPASID who "obviously have failed in their duty to monitor public infomation concerning Merfolk" said William Turner the Deputy UN High Commissioner for Paranormal Affairs. "The last thing we need now is curious fishermen starting a war with Atlantis... ...AGAIN!" When questioned by press on the subject of Mermaids as a naval activities specialist; Captain "Harpoon" Dutton, KBE, Commander, UNETIDA Naval Tactical Support only enigmatically said "You’ll agree we need to be aware of this."